There's still time to register for the Literacy 5K Run/Walk at Schodack Island State Park. Runners and walkers of all ages and abilities are invited to participate in a day of fun including a guided nature walk, a story walk, and a 5K trail run/walk. Multiply the fun and participate with friends and colleagues as a team! All proceeds benefit LVORC. Thank you to all the guests, sponsors and volunteers who made the 2019 Famous Ladies' Tea a great success. Your support makes it possible for LVORC to provide free literacy programs and services to adults and children in Rensselaer County and nearby communities. We hope to see you again next year! We have a way to go to meet our annual goal. Your help is needed now more than ever. Please consider making a donation in any amount to LVORC’s 2019 Annual Appeal. Your contributions allow us to provide free literacy programs and services to adults and children in greater Rensselaer County. With your help, we can make a difference! 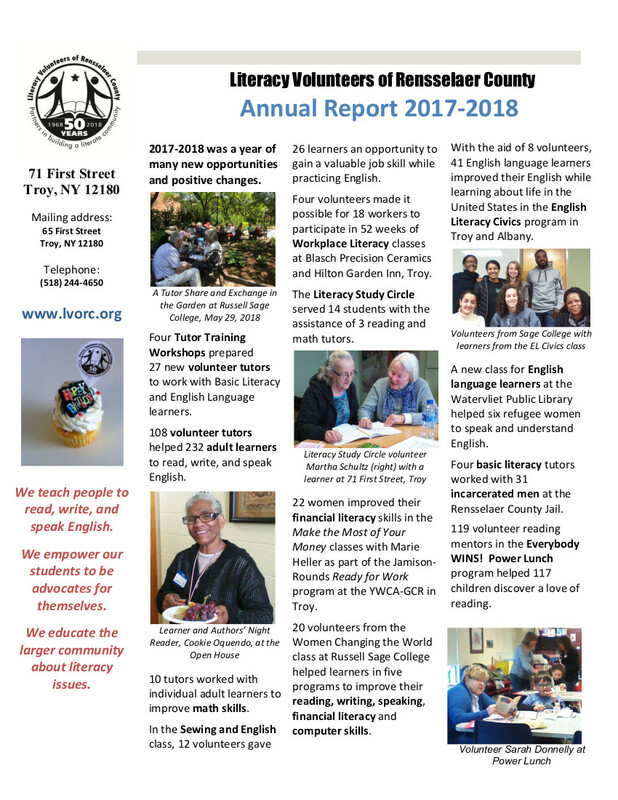 We are proud to share this report of the achievements of Literacy Volunteers of Rensselaer County for 2017-2018. This report highlights some of our many accomplishments. Click to view. All rights reserved © Literacy Volunteers of Rensselaer County.